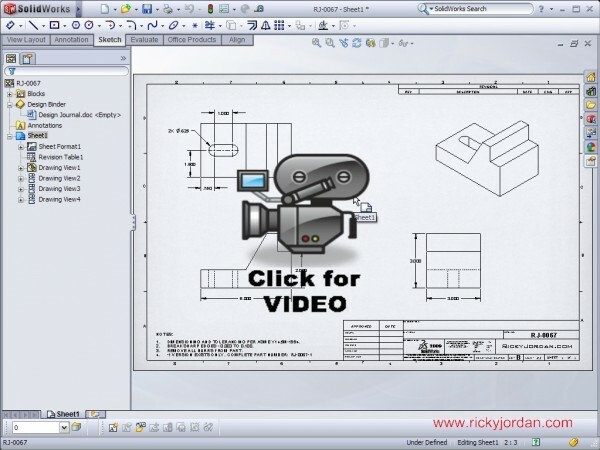 I’m sure if you have read any of the SolidWorks Blogs in the past couple of weeks, you have probably heard of the new Custom Properties Task Pane window in SolidWorks 2009. The interface for this window is completely customizable. SolidWorks includes an application called Property Tab Builder that allows you to design the interface so that you can enter custom properties in Parts, Assemblies, and Drawings in a manner that best matches your company’s engineering processes. 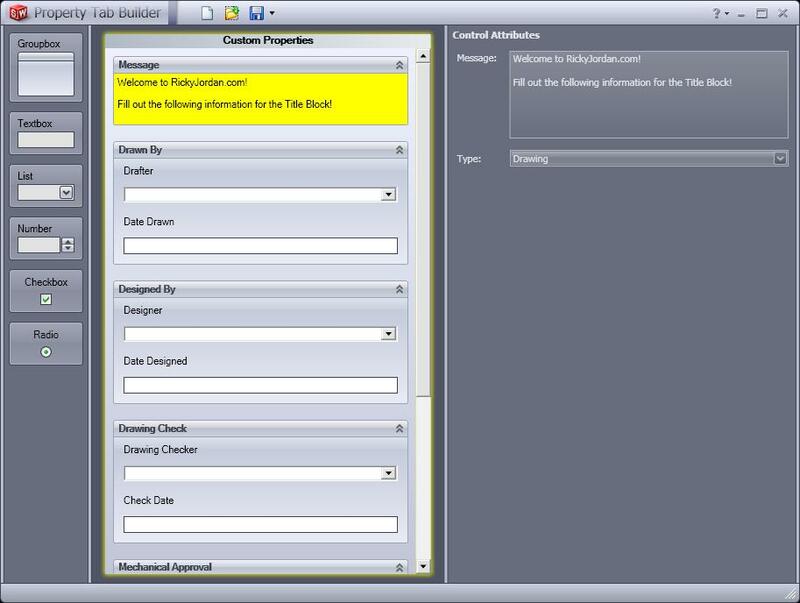 A screen shot of the Property Tab Builder is shown below. Some GREAT news with this is that you can COMBINE this new functionality with the new Title Block Wizard in Drawings. 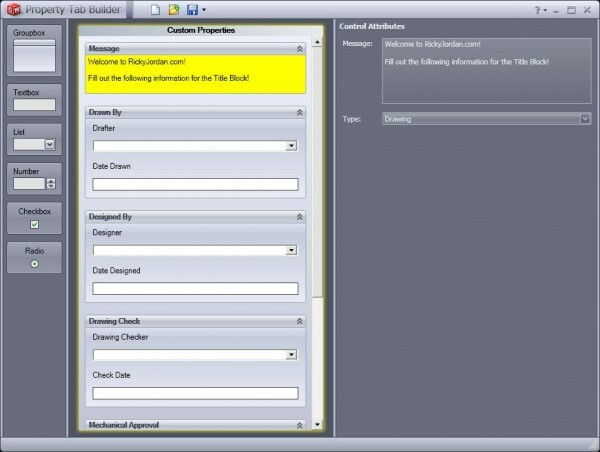 This Video Tip focuses more on how the two can interact together rather than how to build the Task Pane or Title Block Window. I will have posts in the coming weeks that will reveal more details on how you can setup these new features. Click the image below to watch the video. it's so much better to watch it in action then to read about it and try to put it together in your head. Great site i will be sure to look in oftern. How is make Date List? Please help. You set this in the Property Tab Builder (PTB). If you look at the image above (of the PTB) you will see in the group boxes there is a text field for Date. This is defined as a Textbox in PTB. If you click on the text filed in the GUI area, the properties will show on the right side of the PTB. I have it set to a custom property and under “Custom Property Attributes” set the Type to Date. The interface is as slow as a snail. When I try to enter text the thing almost jams. Do you know a way around that? I am using a 64 bit windows xp with 8 gb ram and a q6600 processor. Could anyone help with placing an excel spreadsheet information in a titleblock using the property tab builder. I have the group, list, excel, path, and range. The list shows up on the property tab builder but not in the drawing (I get the group but not the excel list). Any suggestions would be great. I spotted this article when it first came out and started to use the custom prop tab. our problem stems from working in X64 vista and xp i think. when typing in a text box on the custom tab the space bar sometimes jumps two or three spaces. sometimes behaves normally. in the same line of text. the reason i say its x64 is because the dot net is different in x64. some of the controls are different. you will see this in macros, dialogue boxes staying behind windows, strange behavure of dll files not loading etc. Sw know about this as they warned about it in their email tips of “SolidWorks Express: Seven ways to improve your data management” of 3rd june. some of the miles of code in sw needs to checked and updated. try clicking the link to tutorial drawings in the help, tutorials. the dll file that runs that needs to be loaded because of that problem. How did you get the calender to appear in the Date drop-down list? The in the Property Tab Builder, when you add the field for the date, there is a setting you'll need to show the calendar. Under Custom Property Attribute, set the “Type” to “Date”. It is a pull down menu where your other choices are “Text” and “Yes/No”. I’m trying to make custom prop task pane to work. The problem is that is doesn’t want to load custom materials and custom surface treatments from the list I’ve made. Is there any specific way the list must be prepared and named? Few times I got an error asying that the list filename is invalid. HI again. I answered myself…. txt file was set to invalid coding. After changing to Unicode everything’s work.